Early morning start drive from Kathmandu to Kodari (Nepali-Tibet border) through the beautiful Nepalese countryside with spectacular Himalayan View including Mt. LANGTANG (7.246m), Mt. DORJE LKAHPA (6.975) and Mt. GAURI SHANHAR (7.145). From the Friendship Bridge you will drive up to China immigration check post and Tibetan guide will meet you at the border or check post. O/N stay in Zhangmu hotel or drive to Nyalam. Fixed Departure Dates: Every Tuesday and Saturday from April to October and Saturday from November to April on group joining basis. Crossing the Lalung-La (4500 m) and continuing across the plains to Shigatse. After visiting the Tashilimpu Monastery, it's a short drive to Gyantse with its amazing sights - Khumbum, Palkor Chode Monastery. Day 08: Transfer to Gonggor airport for your onward flight to Kathmandu. 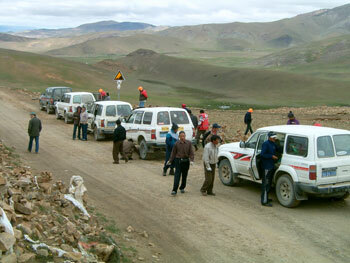 Tibet Travel Permit, entrance fees. Twin share accommodation in standard hotels - 3star hotel in� Lhasa. All land transport using Pvt. Land cruiser. Transfer from Kodari (Nepal Tibet border) to Kathmandu using appropriate vehicle. All hotels and meals in Nepal. Airport taxes and excess baggage charges. Any tips (hotels, restaurants, guide, driver, etc.). Extras cost for up-grading rooms at hotels if/when applicable. Any cost arising from political disturbances, strikes, cancellation of flights, deviation in program, delays due to landslides, road blockage etc (clients have to brone directly a the spot). Would you like to extend your holiday? If your answer is yes, there are many options and choices to extend your holiday before or after your main trip. Following trips are suggested for your holiday extensions.